When you hire new people you want them to be the best possible candidate for the job, of course. You can use various ways to assess their skills and competencies and use realistic job previews to give them a taste of what their future job will be like. The candidates that emerge as the ‘best’ ones may not be your best option after all. Because finding the best person for the job entails more than simply identifying who is the best fit for the actual job. It’s just as important – if not more so – to recruit people who truly fit in the organization. In this article, we’ll give a definition of organizational fit, point out why it’s important and show you how it can be measured. When an employee’s (personal and professional) values and beliefs align with and complement those of the company they work for, we speak of organizational – or culture – fit. As such, it’s important to establish what exactly defines a fit. And that starts with determining the organization’s values, norms, and vision. However, organizational fit doesn’t mean you need to hire the same kind of people all the time. As Katie Bouton states in her article ‘Recruiting for Culture Fit’ for HBR, the values and attributes that make up an organizational culture can and should be reflected in a richly diverse workforce. Wondering what happens when you don’t ask that question? Imagine you’ve just recruited a great candidate. Three months into the job your freshly hired employee seems a little unmotivated; they get in late, leave early, take a few coffee breaks too many, etc. When you talk to them about it you find they absolutely love the job, are more than happy with their compensation & benefits package, but somehow feel out of place. It won’t be long before your now ex-superstar leaves the company – forcing you to start the recruitment process all over again – which is why it’s crucial to hire people who fit the organization and vice versa. Why is organizational fit important? While job fit, referring to how the person is suited for the specific role, is undoubtedly crucial to hiring the right employee, there are many reasons why finding candidates that mesh with your company culture is also important. Let’s take a look at a few of them. The example we used in the intro of this article says it all. No matter how much someone loves the job they do – or how good they are at it – if they don’t feel like they’re in the right place they’ll end up leaving. Luckily, the opposite is true too. If you hire someone who fits your culture like a glove, they will be much more inclined to stay with the company for a longer period of time. In other words: if you focus on both job – and – organizational fit during your recruitment process you’ll lay the foundations for a lower turnover rate. People who are a good organizational fit will dramatically improve your quality of hire – and not only because your employee turnover will go down. Employees who feel ‘at home’ in the organization they work for generally are happier which has a positive impact on their productivity – and of course their engagement. They’ll need less time to become fully operational for example and they’ll boost their colleagues’ morale while they’re at it. There’s no secret recipe for employee engagement. But if there was, one of the ingredients would be organizational fit. People who work for a company that shares their values will do so (much) more wholeheartedly than those who don’t recognize themselves in their company culture at all. All of these elements lead to increased employee productivity. Once again, this stresses the importance of hiring for culture fit and not just for job fit. Employees who feel like they’re right where they belong – professionally speaking – are super productive. They won’t get in late or leave early, let alone take coffee breaks every hour. Employee referrals are a great way of recruiting new people. Referrals tend to be operational faster, they are more productive, more engaged, and stay with the company longer. The reason for this ‘referral success’ is simple; since these candidates have been recommended by your current employees there’s already been some sort of natural organizational fit assessment. This means that if you successfully focus on organizational fit in your recruitment process and hire more people who mesh with your company culture, you’ll eventually have even more excellent referrals too. How can organizational fit be measured? It’s all good and well to know why organizational fit is important but if you don’t know how to measure it in your candidates, it isn’t much use, right? Recruiters consider cultural fit the most difficult attribute to assess during an interview. So, let’s get practical and check out a few ways to assess organizational fit. Perhaps stating the obvious, but before you can do any kind of assessing you will need to know exactly what your organizational culture is like. What does your company stand for? What are the core values, beliefs, vision, etc.? One thing to bear in mind is that company culture constantly evolves and hence, and your assessment should too. The process of defining your organizational culture and the core values that come with it is worth an article in itself. We’ll say one thing here and that is that you’ll need to involve the entire organization in the process, collecting feedback from everyone. Assessing organizational fit is not an exact science and might be subjective, which can result in a biased hiring process. That’s why it is a good idea to use a standardized assessment as one of the ways to measure culture fit. Pre-employment assessment tools come in many shapes and sizes. Many of them – our Harver solution included – focus on finding candidates that align with your organizational culture. By infusing the assessment experience with various culture-related elements. Think of open questions, a company video or situational judgement tests for example. Some pre-employment assessment tools even have a so-called culture fit module. It usually compares a candidate’s preference for an organizational culture with the actual culture in place at your organization. The assessment can take on a variety of formats. For example, it might be a validated questionnaire that assesses the applicant’s culture preferences across six key dimensions of organizational culture. These are dominant characteristics, organizational leadership, management of employees, organization glue, strategic emphases, and criteria of success. 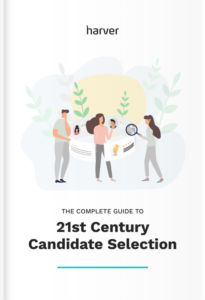 Once the company assesses their organizational culture on the Competing Values Framework, they are able to compare their preferences with those of the candidate’s. Include videos in your recruitment process that let candidates experience the job and find out how they respond to ‘real life’ on-the-job scenarios. More broadly speaking, videos can be a great way to give applicants a sneak peek into your company. Just like it’s easier to get a feel for a candidate’s personality via a video call, it’s also easier to get a feel for the office vibe and the type of people working there through a short video. Granted, this may not always be possible. When you’re interviewing someone who lives on the other side of the world, they won’t be able to pop around for the afternoon. If your candidates live within a reasonable distance from the office though, you may want to consider this option. Ideally when you’ve got a team building day or some other kind of semi-informal team activity planned. Although this is no scientific way of measuring organizational fit, it will give both the candidates and you a good idea of how they blend in. On the candidate’s side, they’ll get a feel for how your employees interact with each other when they’re in a more relaxed, not purely work-only setting. As such, they’ll be able to better imagine themselves working for your organization (or not). What’s ‘right’ here will depend on your organizational culture. But asking culture-specific questions during the interview stage certainly helps in identifying whether or not a candidate meshes with your company culture. Think for instance of questions like ‘Can you describe the work environment in which you perform best?’ or ‘How do you feel about becoming friends with your co-workers?’. Interviews remain the top method to assess organizational fit. This one is along the same lines as number 3, only now out-of-office settings are included too (and again, it may prove difficult to do this with candidates who live abroad). What it comes down to is this: try to spend time with candidates outside the official interview process. Invite them for a team lunch for instance. Or if there is an industry event, ask them to tag along. The way someone behaves during these kinds of ‘unofficial’ moments can tell you a lot about them – and their values. Are they attentive and interested in their potential colleagues? Or do they keep looking at their phones? The same thing goes for the candidates, of course. After all, the ‘trying to see whether there is an organizational fit process’ is a two-way street. Everyone being the taxi driver who drops the candidate off at your office and the receptionist welcoming them, to the team members and members of the C-suite. Perhaps you’ve heard this story before but since it’s a great one we’ll tell it anyway. It’s the one about a candidate, let’s call him Matt, who was interviewing at a big company in the US. He was doing pretty well and got to the final interview stages. Matt was one of those people who interview incredibly well – the perfect candidate in that regard. So from a management level, he’d gotten all the necessary green lights and was going to get an awesome job offer. Unfortunately for Matt, the company attached great importance to the way its employees treat support staff – both inside and outside the organization. Needless to say, there was no professional happily ever after for Matt at this company. But to cut a long story short: involving as many – different – people as possible to create plenty of interactions with your candidates is a great way to learn more about them as human beings. Unlike what you may think, reference checks are more than just a formality. Yes, most people will sugarcoat a candidate’s not-so-great character traits a little. But if you ask the right questions (yep, there they are again) and in a good way, you’ll be able to get valuable insights. Think of reference checks as a way to confirm – or not – your internal assessment of a candidate’s organizational fit. It’s no secret that many companies struggle with high employee turnover and low quality of hire. And while there are more ways that lead to Rome when it comes to battling these issues, organizational fit is one road you should definitely go down. Instead of solely focusing on finding the perfect candidate for the job, concentrate on identifying the right organizational fit too. Consider it a two-way street; not only do your candidates have to fit your company culture but your organization also needs to fit their values and beliefs as well. There are various ways to measure organizational fit. To assess culture compatibility in an efficient way, you may want to opt for a combination of some of the 7 ways listed in this article. A candidate who is both a job and an organizational fit will make for an enthusiastic, loyal and productive colleague, and that is who we’re all trying to find, right?